My house yeast strain is very saison-esque, which is great for the yeast forward farmhouse ale, but not so much for a hoppy session ale. But in the spirit of farmhouse brewing, I wanted to use a single foraged strain for all my beers. To overcome the yeast’s high attenuation, I mashed at an absurbly high temperature (160°F) after reading about Bertus Brewery‘s workaround to increasing body in his Micro Pale Ale. To reduce the phenols from the yeast, I lowered fermentation temperature from 72°F to 66°F. After achieving a near-perfect level of haziness in Farmhouse Ale #1 and #2, I (roughly) mirrored those adjunct percentages in this malt bill in hopes of capturing that signature New England haze. 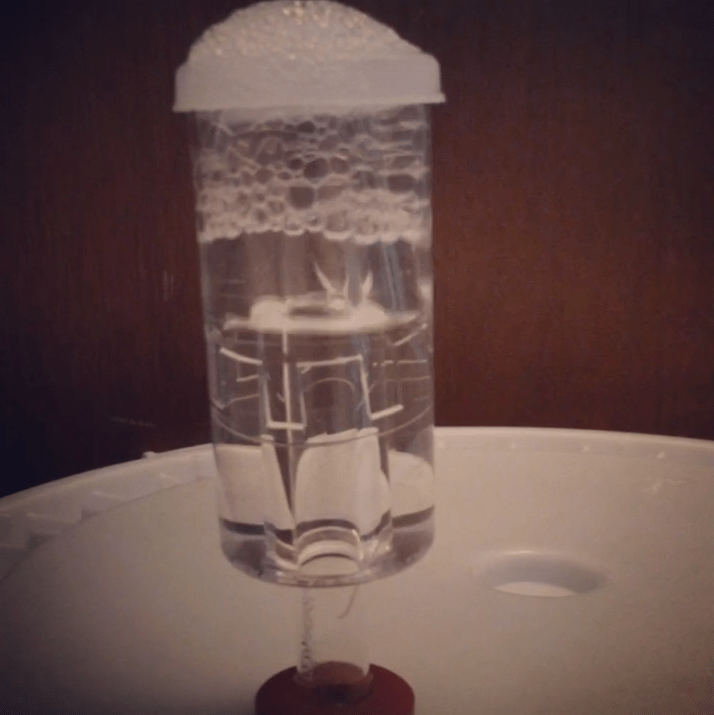 In addition to the higher mash temperature, I changed the water profile from Bru’n Water’s Yellow Bitter to a NE IPA version (Braufessor’s high chloride profile) since the high chloride/low sulfate ratio is believed to give beer from breweries like Hill Farmstead that soft, pillowy mouthfeel. And last, but not least, I added more hops throughout the entire brewing process to increase bitterness and aroma. In addition to the above changes, I also split the batch four-ways and dosed each fermentor with a different dry hop (Cascade, Centennial, Rakau, and blend of all three). Needless to say, this recipe was a major overhaul. Description: A low alcohol, light-bodied, straw-colored, dry, refreshing, and hop-forward grisette-inspired session beer. Notes: Brewed with Flynn on 2/10/2016. Measured pH values of 5.32/5.59/5.96/5.7/5.89 (mash/2nd run/3rd run/preboil/postboil). OG was spot on at 1.039. No oxygen. Fermentation started at 66°F. Single dry-hop only, due to work travel. Dry hopped with 1.5 oz/gal (4.5 oz total) of Cascade, Centennial, Rakau, and blend of all three for 72 hours (one dry hop per fermentor). Moved to kegs on 2/26/2016 for 1.5 weeks. Final gravity was 1.006 and final pH was 4.36.